You will be hearing more about this Guild program in the future. 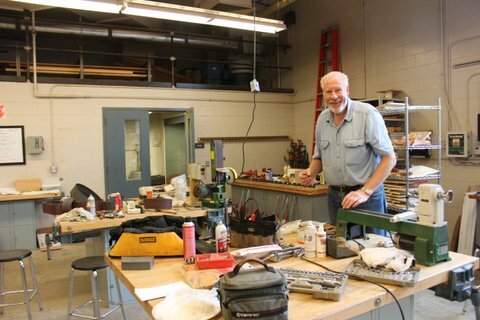 GIS is an opportunity to involve Guild members in local school woodworking programs in a variety of ways. It was the brain child of Jon Siegel and is being actively pursued by the Steering Committee as part of our Guild Directed Programs. A photo of Jim Forbes at the Pinkerton Work Day on October 22. Woody Magnuson, Jim Forbes and I spent the day with Steve Sackman, the shop teacher working on twelve lathes and got eleven into working condition and the 12th needed only a couple of parts from the local hardware store to be ready to be used. Woody also installed the new Wolverine sharpening system.